One of the best tools that companies have at their fingertips is the human facilitator who develops relationships, manages change, provides subject matter expertise, and communicates directly to the organization’s employees. The role of a facilitator is likened to being “bit by the acting bug.” Much like actors and actresses who hone their craft and become beloved stars, facilitators must have stage presence, convey content expertise while coming across as engaging, personable, and accessible. There is definitely a myth that being a facilitator is an easy job – we jet set to interesting locations and live the high life; work for a few hours and call it a day, but that could not be farther from reality. In reality, facilitators are often road warriors with hectic schedules. As a facilitator, I’d leave my home base of Denver, Colorado on Sunday afternoon and arrive at my destination, work 10-12 hour days; travel back to Denver and arrive home at 11 PM on Friday of the same week. After 36 hours of rest, I’d hit the road again for another glamorous week of facilitation. In most cases, facilitators create and edit their own content for their facilitation sessions, and we are our own IT experts. Sometimes a computer might not communicate properly to a projector or with an HDMI cord, so a facilitator has to be versed in basic troubleshooting. In a worst-case scenario, the laptop crashes and a facilitator is unable to project the visual aid which is catastrophic! Facilitators have to be ready for anything and everything at the drop of the hat -- that readiness comes with experience. If you’ve attended training and walked away with a participant guide or job aid, there’s a strong likelihood that a facilitator assembled your guide and distributed it to you after arranging the classroom for maximum comfort and visibility. Product trainers have to bring the product, set it up and tear it down; some trainers travel with 2-3 trunks of products that have to be transported to the next training location, wherever that may be! Facilitators are also the liaison between the trainees and stakeholders of the training, ensuring the class roster is accurate and communicated to the correct person. Many facilitators are lucky enough to have state-of-the-art training facilities or use hotel space as classrooms, but what about field trainers who facilitate in the hot Colorado sun in a rural area in a 200-square- foot room with intermittent Internet and little to no air conditioning? Yes, I’ve been there. I’ve even had to wear a hard hat, safety goggles, and a reflective vest all in the name of training! 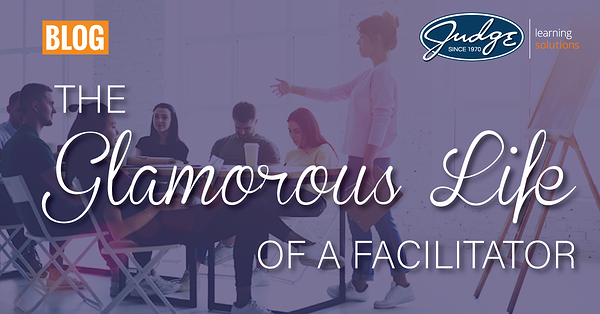 With scores of experience, any facilitator can make facilitating appear easy and glamorous, but it is neither. A facilitator influences participants, manages change, is the company cheerleader, and above all, contributes to the overall success of a company by making the employees better than they were when they walked through the classroom door. When the doors to the classroom close, we walk away knowing we’ve had an impact on people and business. In spite of all the challenges we endure: flight delays, time away from family and friends, technical issues, and exhaustion, the appreciation of our trainees and the measured results we achieve makes it all worthwhile. When it comes to facilitating a variety of topics, Judge Learning Solutions leverages the best facilitators in the business. Visit www.judge.com to learn more about the topics we facilitate for our clients.